My Life in France was about what I expected and it was also not what I expected at all. I was rather glad, actually, that I had seen Julie & Julia before reading the book. Before having seen the movie, I had never really paid attention to Julia Child at all. Sure, I had seen spoofs of her, but I didn't realize people were mocking her. I had never heard her voice for real to know what all the fuss was about. Hearing her manner and style of speaking in the movie, prompted several Youtube sessions and it gave me a voice through which I could read this particular book. That made the whole thing more fun. I absolutely do not begrudge her the love of France, French people or French cooking. But she does take on a rather condescending air in the book that any American who did not understand this or agree with her whole heartily, was small minded. That is a particular attitude that I do not appreciate very much because I think there is great honor in loving your home country. I am very proud to be an American and to be able to live here. I would choose to live here under either of the main political parties (in other words, I've never made a threat to leave the country if my own choice for president wasn't elected). I love this country, plain and simple. I appreciate other countries and enjoy visiting them. But America is my home. 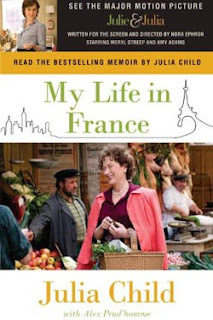 Julia Child's "I love France more than America" was a bit off-putting at times, but not so much so that I couldn't enjoy the book. As for cooking, I have to say that, for the most part, I appreciated her attitude. (Now that I've seen her chunk pots, pans and food aside on episodes of The French Chef, I'm more amused.) Something I both appreciate and question to a degree is her attitude towards serving people meals that didn't come out quite as you had hoped. I think there is (or ought to be) a balance. I don't know that I would say a hostess should never apologize for her poorly made meal. After all, when we invite guests into our home, we want them to feel treasured and enjoyed and one way we show and tell them that is by making something especially for them - hopefully something that they'll find appealing! At the same time, it IS the role of the guest to show appreciation and gratefulness because someone else is obviously putting time and energy into providing a meal for them and that's no small matter! That's HUGE! So it works both ways. We should want to set our best meals down before guests. And when we are guests ourselves, we should be gracious and show appreciation for whatever we are given to receive - whether we like it or not. The thing I found most amusing in Child's book was her exposure to American supermarkets when trying to research and prepare Mastering the Art of French Cooking for an American public. On the whole, I thought this book was insightful as to personalities and entertaining as to culture and her own brand of....being. I quite enjoyed it and am glad I spent the time becoming more acquainted with Mrs. Child. Again, not totally what I expected but not altogether unexpected either. I have been wondering about this book, ever since reading "Julie and Julia" (which I did not enjoy) and after seeing the theater movie "Julie and Julia" which I greatly enjoyed. I think I may just read this book now. Thanks for the review!